On Saturday 2nd September we held our very own Eid Celebrations here at Queensmere Observatory. 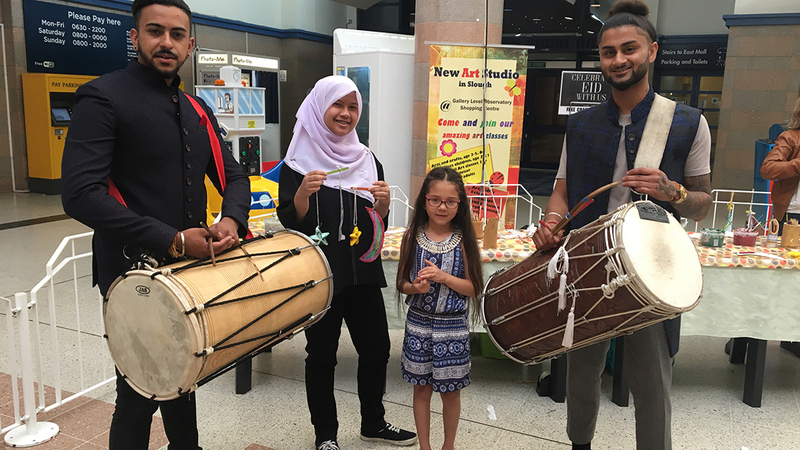 Dhol Drummers performed for our shoppers with their traditional and exciting rhythms becoming the fun soundtrack for the day. In addition, a Henna Body Art station was set up with many shoppers picking out intricate and traditional designs for themselves. For our younger shoppers, there was a free arts and crafts workshop for anybody who wanted to show off their creative skills! Many other stores in Queensmere Observatory also participated in the Eid Celebrations. The Noor E Hidayat Islamic Bookshop also provided Traditional Henna Art to customers and Dignity By Deen also gave customers 25% off as part of their in-store sale! This was a great event for all that attended, keep an eye out on our Website, Facebook and Twitter for any event pictures and for any upcoming FREE events that we have planned for the rest of the year!